The jury that convicted Dante A. Hughes last month of fatally shooting Joey Gingerella outside Ryan's Pub in Groton in December 2016 might have used outside materials during deliberations in violation of the court's instructions. The 12 jury members who found Hughes guilty of first-degree manslaughter with a firearm on July 26 are being asked to return to New London Superior Court on Sept. 4, when the trial judge, Barbara Bailey Jongbloed, will question them to determine whether there were any improprieties. Should she determine there were improprieties, she may declare a mistrial and order a new trial. Several court officials who wish to remain anonymous due to the sensitive nature of the situation said a jury member who returned to court recently to ask about getting paid for her service told acting Jury Clerk Monica Endres that another juror had looked up the definition of manslaughter in the dictionary, despite the judge's instruction to rely only on the information provided by the court. The use of extrinsic materials is not allowed. The judge had provided detailed instructions on the pertinent laws prior to deliberations. The jury charge contained the state's legal definition of murder, which was the original charge, and manslaughter with a firearm, which the state added as another option for the jury, called a "lesser included charge," during the trial. The 12 jury members each received a printed copy of Jongbloed's 26-page instructions. David S. Gage, chief clerk for the New London Judicial District, said there would be a transparent process to flush out the facts. "We're going to get to the bottom of this, and we're going to do it on the record," Gage said. Senior Assistant State's Attorney Paul J. Narducci, who prosecuted the case with Assistant State's Attorney Christa L. Baker, said he couldn't comment because of the ongoing nature of the matter. 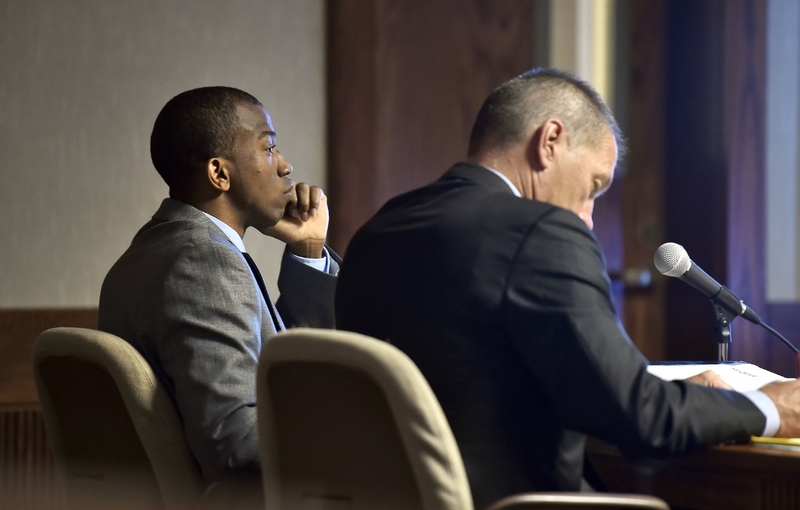 Hughes' attorney, Walter D. Hussey, confirmed the Sept. 4 hearing date but declined to elaborate. Gingerella's mother, Tammy de la Cruz, and stepfather, state Rep. Joe de la Cruz, D-Groton, were informed of the possible juror impropriety and its potential to invalidate the verdict during a meeting last week with Narducci and Victim Advocate Stephanie Barber. They did not respond to requests for comment. Should the verdict stand, Hughes, who is 32, faces up to 50 years in prison when Jongbloed sentences him Oct. 4. He stands convicted of first-degree manslaughter with a firearm with reckless indifference for human life, which carries a 40-year maximum sentence, and criminal possession of a firearm, which exposes him to an additional 10 years. The weapons charge was decided separately by Jongbloed so that the jurors would not be prejudiced by learning that Hughes, who previously was convicted on felony drug charges, could not legally carry a gun. Testimony at the trial had revealed that Hughes shot Gingerella, 24, in the parking lot of the neighborhood bar after Gingerella and others stepped in to stop Hughes from beating his live-in girlfriend, Latoya Knight. Gingerella, who sustained three gunshot wounds, was pronounced dead a short time later. The jurors announced their verdict on the third day of deliberations after signaling a day earlier that they were having trouble agreeing unanimously, as required, on a decision. The jury foreperson told Court Officer Martha Jenssen the members agreed that Hughes was "guilty of something," but couldn't decide what. Jongbloed assembled the panel in the courtroom and reminded them they were to communicate with the court only by sending out a note. Hughes' attorney moved for a mistrial, saying the court had been told repeatedly to communicate only by note. The judge denied the motion, saying the event was not so prejudicial to the case that it was irreparable. A short time later, the jury sent out a note asking the judge to help them understand her instructions on the state's burden of proof with regard to the issue of intent. She told them that to find Hughes guilty of murder, they had to find that he acted with intent to kill somebody and did, in fact, kill somebody. Her previous instructions indicated there is no particular length of time necessary for Hughes to have formed the intent to kill. She told them that if they found Hughes was not guilty of murder, they must next consider the manslaughter charge. The jury also asked that day if it could look up the definition of manslaughter in a dictionary. Jongbloed told the jurors they were to refer only to the instructions provided by the court. In the instructions, the judge cited the state law that indicates a person is guilty of manslaughter in the first degree with a firearm "when under circumstances evincing an extreme indifference to human life, he recklessly engages in conduct which creates a grave risk of death to another person, and thereby causes the death of another person." The jury found Hughes not guilty of murder, a decision that distressed Gingerella's family members and now raises the question of whether he can be tried again on the murder charge if the judge declares a mistrial. Under the law, the state cannot prosecute someone more than once for the same crime. Court officials said they are researching whether the double jeopardy principle would apply in this case.